Shown above is some text I've prepared for my next print. By the first two names you can probably tell that this is a list of gay, lesbian, bisexual and transgender individuals who have been murdered in America in the past thirty years or so. It is by no means a complete list. And for me it is by no means an impersonal list. The third individual recorded here, Joseph Kelly, was my friend and neighbor. Joe lived downstairs from me in a small house in Somerville, Massachusetts, that had two apartments. The night he was murdered I was out on a date with a woman I had just started seeing. I think we went to a party that night, I'm not sure, but I stayed overnight with her. When I returned home and opened the front door into the foyer which was shared by the two apartments, I knew immediately that something was wrong. My bicycle, which I usually kept in the hall, was missing and there was a strange odor. I went upstairs to my unit and moments later the phone rang. It was my landlord David, Joe's longtime friend and sometimes lover, who lived in the front house on the property. David asked if he could come over. I let him in, we went upstairs and David shivered as he told me the story. He had found Joe in the hall, barely alive, bound and gagged, stabbed nine times, partially dismembered, and his skull fractured. Joe died in David's arms, and David refused to allow anyone except himself to clean the crime scene. I later learned that this was because David had AIDS and was afraid that Joe might also carry the virus. One of the things I remember most from this event was the kindness shown by the Somerville police. The detective who was investigating the case interviewed me a couple of times and, although he was clearly unfamiliar with what he termed "the gay lifestyle," he was very compassionate towards what he was learning about Joe through reading his diaries and immersing himself in the details of Joe's life. I really liked that detective. The perpetrator, a man named Thomas Moore who had met Joe through a personal ad, was caught fairly quickly. Moore, who had recently been released from prison, stole a leather vest, a camera, and a bank card from Joe's apartment after the murder, and it was his attempt to use the card without a password that led to his arrest. I'm always grateful that I wasn't home that horrible night. I'm grateful for the friends who came and slept with me in the first days until the police captured the killer. And I'm grateful for the huge wake up call that Joe's death brought to me. I began to see a therapist in the aftermath, and within 6 months I had given up alcohol and drugs. Seeing how fragile life could be, I wanted to be fully awake every moment of whatever time I had left in my own life. Almost exactly one year after Joe's death, and four months before the trial and conviction of Thomas Moore, David succumbed to AIDS. He was one of so many that we lost to AIDS in that decade. 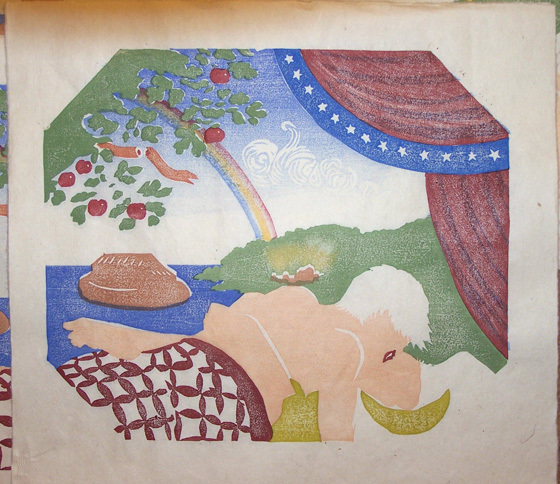 I’m putting this post together for my upcoming Woodblock Class at Zea Mays Printmaking (Feb. 23-24, 2013) but by all means read it if it interests you. In the post I’ll be showing a few possible ways to compose and prepare an image for woodblock with an emphasis on preparing simple images that can realistically be finished in two very short days using mokuhanga techniques. 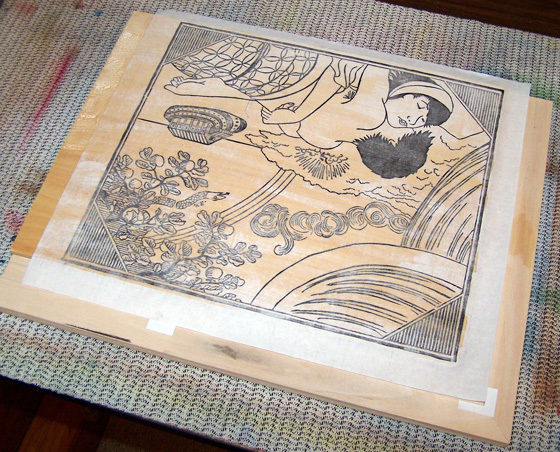 The traditional method used by the ukiyo-e artists was to make a drawing for a keyblock, which would be carved, printed in black, and then used to develop color blocks. This method is sort of like coloring in a coloring book. 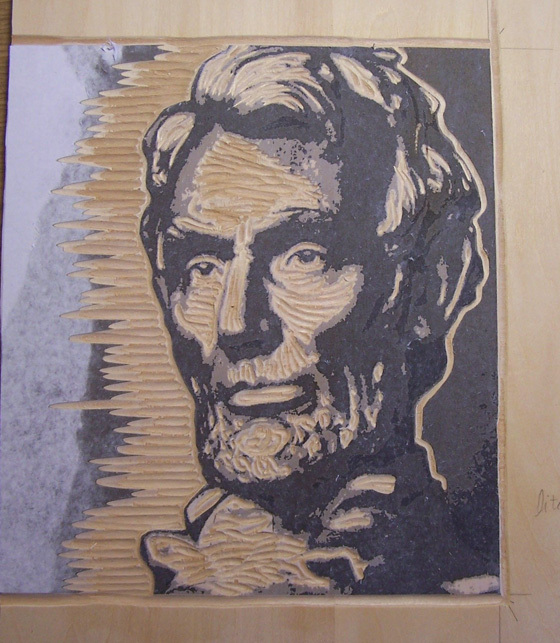 I started with a black & white sketch which I pasted onto a block and carved. This is the finished carving. Next I printed several copies of the carved keyblock with black ink and pasted these copies onto fresh blocks. Carving right through the thin paper, I cut blocks for each color. This is how the blocks appear after they've been used for printing, which I think makes it easier for you to see how color was broken down. Notice that it's possible to use one block for multiple colors as long as there's enough space between the colors to ink without accidentally getting ink into areas where you don't want it. 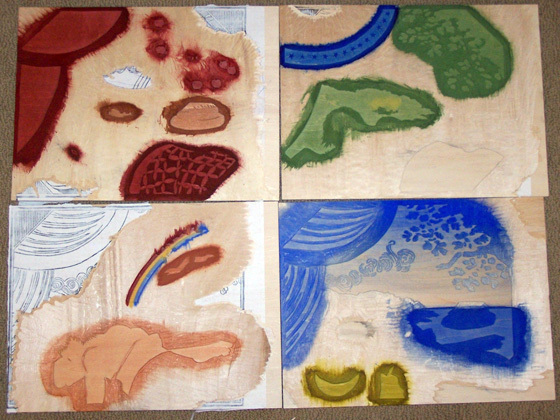 Here is the image with all the colors printed, just waiting for the addition of the black keyblock. The final print with the keyblock added. This method is the most traditional, and it’s also much too complex and time consuming to attempt during a two-day workshop. 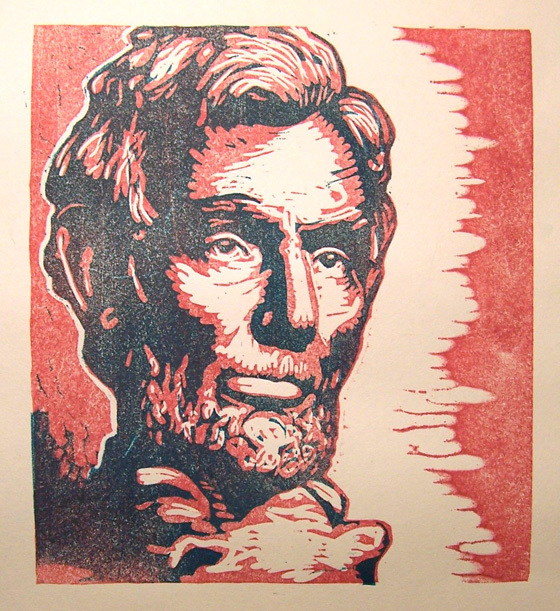 Although, having said that, artist Franklin Einspruch made a simple but striking keyblock-style print during a two-day workshop which you can see by clicking here. If you really want to use the keyblock method, keep your line drawing very simple and don't expect to be able to carve thin lines unless you’ve done it before. By eliminating the keyblock and thinking of your image as fields of color that might or might not overlap, you can make a strong picture using just two or three colors. Because the waterborne pigments are transparent, you can make green by overprinting/overlapping yellow with blue, make violet by overprinting red with blue, etc. 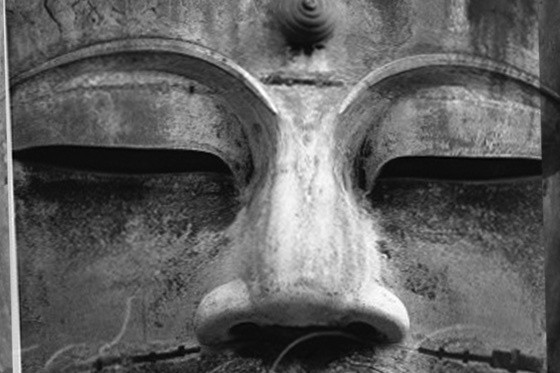 You can work from a photo, as I did for this simple print of the face of the Kamakura Buddha. I used a piece of tracing paper to mark out three values. I wanted the areas marked by an X to be white (the color of the paper) in a field of pale green, the red areas a middle value green, and the darkened areas a deep blue-green. Here is a breakdown of the three different blocks printed separately (column on the left) and as a composite (on the right). You can see how much information can be carried with three simple blocks. 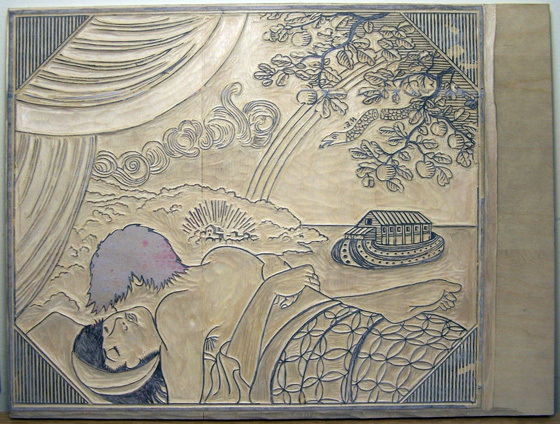 This is an image with more complex carving, but created using just two blocks. This image also shows how overlapping colors can be used. I made this image for a portfolio exchange which required us to use red and a very turquoise blue. 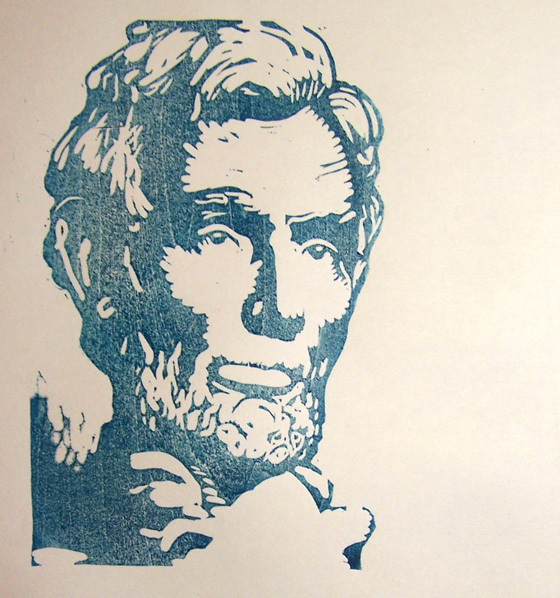 I didn't like the blue, so I decided to overprint the two to make the blue more black. Again I worked from a photo, this time a photo of the Lincoln Memorial statue’s face. 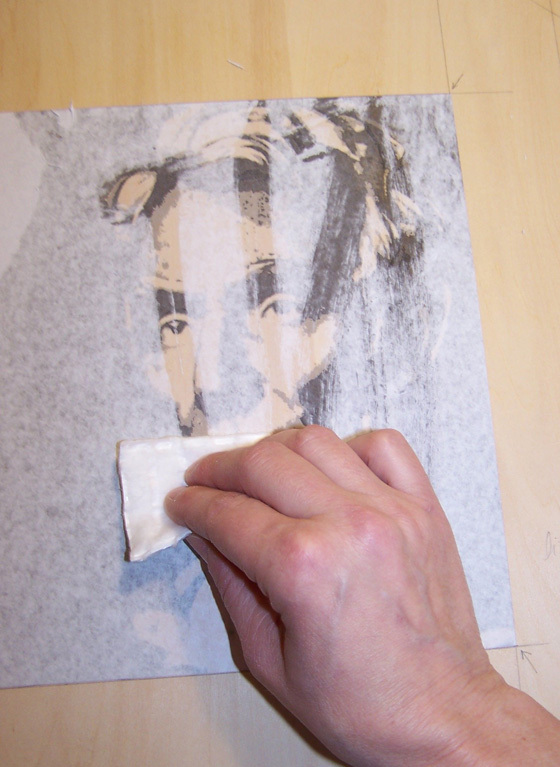 You can use this method if you think you would feel comfortable doing some loose carving from a photo or drawing or even a painting you've previously done. Even after delaminating the paper it can still be hard to see the image clearly. 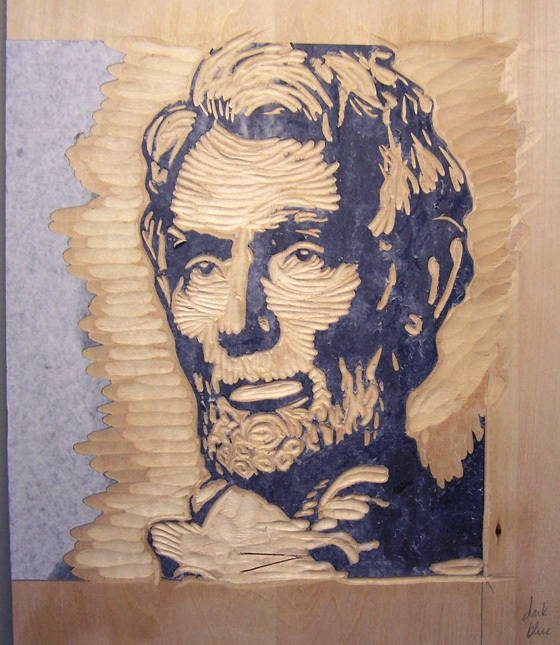 A thin application of mineral oil makes the image perfectly visible. On one block I carved away everything that would remain white (the paper color). You can see my chisel marks, which I tried to make a bit more loose and expressive than the Buddha in the example above. Here's the block above printed in red. On the second block, I carved away everything except the areas which I wanted to be dark. This block I would print blue. Here's the composite, blue overprinting red. 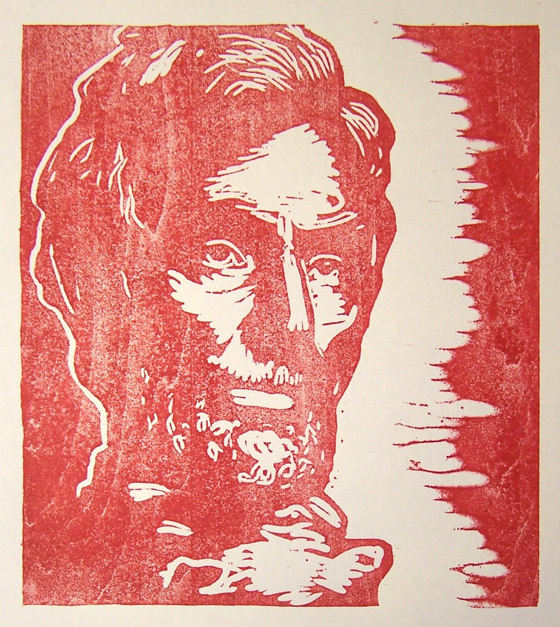 Ultimately, after feedback from the portfolio group, I ended up printing the two Lincoln blocks with tones of blue and adding a third block -- red stripes whose formation are the I Ching symbol for "union." 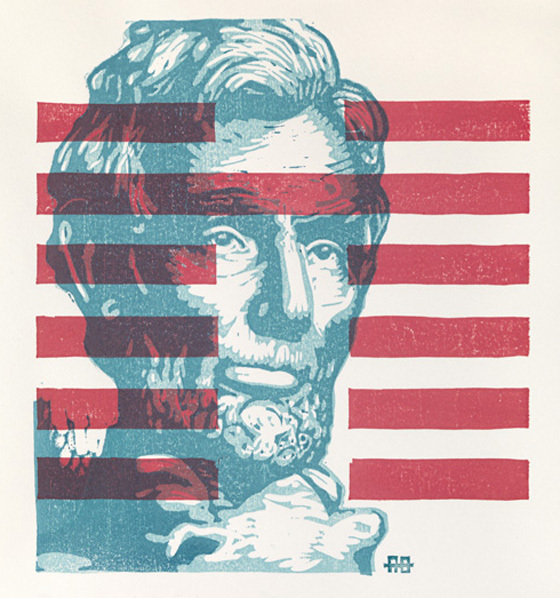 You can see the color effects of the red overprinting the two tones of blue. So these are the two basic methods of image transfer we'll be using -- 1. pasting down a printout / photocopy or 2. Using carbon paper to transfer a design/drawing. If you're a person who likes to work spontaneously, you can come without a sketch and just bring a sharpie to draw right on the block. 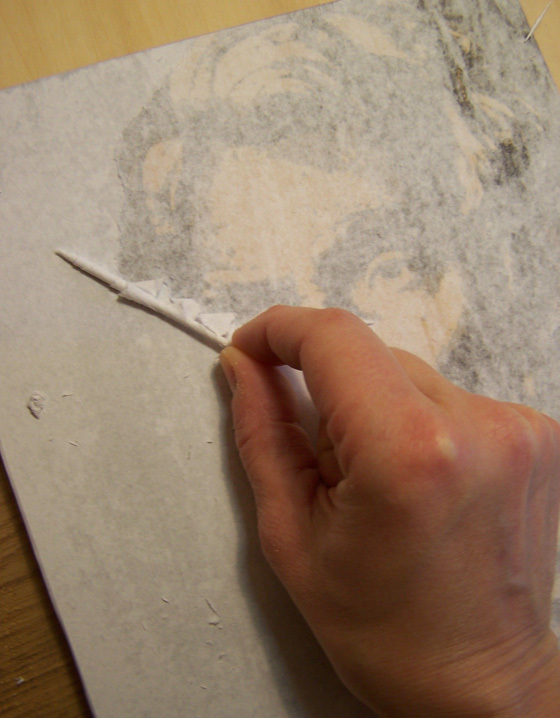 Or you can "draw" with a chisel, making marks in the moment. To get a better idea of what is possible to accomplish in a two-day workshop, click here and here to see some student work from other workshops. And please refer to your participant letter for details on how to size your sketch before you arrive. On a technical note, this print was made with three simple blocks, shown below. Sometimes I enjoy a break from doing a lot of intense carving. Two more applications of watered-down sumi ink give the stone a realistic look. Now on to the background. Sometimes it's a tremendous relief to just work with a simple shape and leave all the fancy carving behind. The process of making this new print will be more about printing than carving. 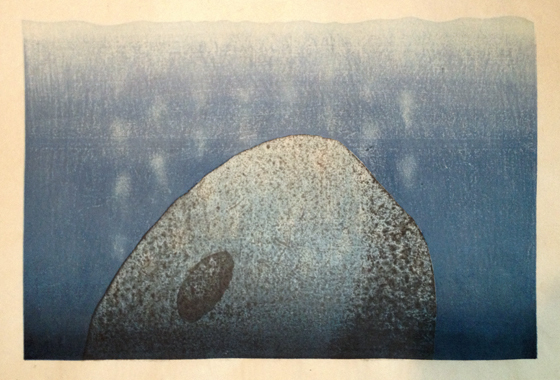 The speckled pattern that one can achieve with mokuhanga is called gomazuri. Gomazuri is created by using a lot of water and a light touch with the baren. I want the surface of this shape to look like rock. 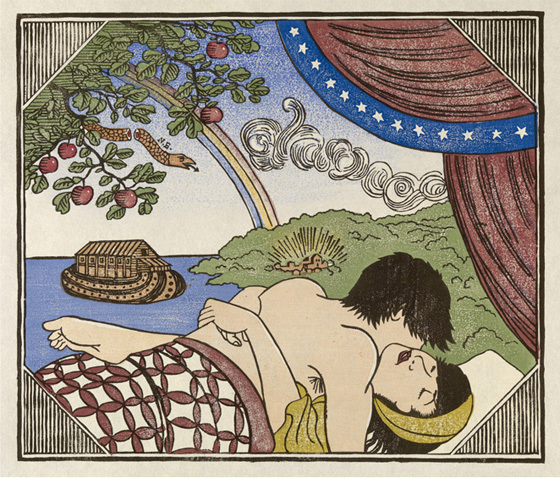 This print is the start of a new series about gays and God. The series, which will be available as both individual prints and a small number of bound books, bears the working title God Is My Witness. Although this image, which is based on a video from a specific church in Indiana, is an extreme form of the message that God condemns homosexuals, this message can be heard in various strengths in churches (and temples and mosques) all over America on any given sabbath day. For a young gay person who wants to know God, the message can be devastating. And for a young person who is insecure or unloved or otherwise suggestible, this message can be heard as God's permission to do harm to others.